The 2013 Washington Auto Show is always a big attraction for fans of anything on four wheels in Washington DC. In recent years it has been the showcase for green technologies as they pertain to the automobile. While that was present this year at the show, performance still was found in abundance. This year’s show kicked off at the beginning of February but had the disadvantage of overlapping with the Chicago Auto Show [http://www.chicagoautoshow.com] which happens to be the nation’s largest auto show. With Chicago having higher attendance numbers than Washington, the one-of-kind concept cars or some of the upcoming red hot productions cars, that many witnessed the unveiling of, at the Detroit Auto Show (which ended right before the Washington show), went to Chicago instead of Washington. An example of a car that was diverted to Chicago instead of the Washington show was the all-new 2014 Corvette. Don’t let this little bit of news fool you, there were still plenty of new cars at the Washington Auto Show to raise your pulse. Here’s a list of the 5 best new performance cars at the show this year. Upon first reading this, you might cry foul on this pick, however there was no doubt The Lexus LFA was one of the best performance cars showcased at this year’s show. The 2-seater LFA may have just recently ended its very limited production late last year (production officially ended on December 17, 2012) but it was still the crown jewel of the Lexus display. Let’s begin with its unique styling which can best be described as a mix of the typical Fast and Furious movie car and a high-end exotic Ferrari. 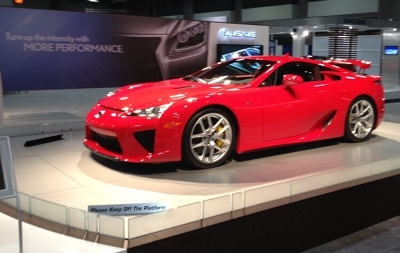 Lexus spent lots of money on the development LFA which was produced from late-2010 to 2012. In fact so much money that they lost money on every LFA sold. If ever there was a text book case of a car that was over engineered this is probably it. Even the exhaust note was designed for perfect pitch, note, and tone. Observant onlookers will notice the LFA’s three exhaust pipes which is an oddity not found on any other car which is one of the factors that accounts for its unique sound. The sound is supposed to mimic a Formula 1 race car, a job it does so very well – especially when you consider this is a V10 engine, which generally doesn’t have the mellow rumble of a V8 or the distinctive clamor of a V12. The LFA’s naturally aspirated 4.8 liter V10 which produces 552 horsepower and 354 lb-ft of torque was designed, engineered, and built in a joint effort between Lexus and Yamaha. Even though the weight of the LFA is a stout just over 3,500 lbs, the LFA goes from 0-60 mph in a lightning quick 3.6 seconds and the quarter mile in 11.6 seconds at 125 mph – this car will run with the best of the exotic sports cars. Where the LFA really shines is in its state of the art construction which consists of carbon fiber body panels and a carbon fiber-reinforced polymer (CFRP) center monocoque with aluminum front and rear subframes. It gets even better inside the cabin with one of the most comfortably supported seats you are going to find in a car with excellent lateral support which is important when the LFA is hitting its limit of 1.05 G in the hard corners or at the track. And the dash layout is one most state-of-the-art setups and most functional you are going to encounter. The best way to describe the LFA is it is sheer precision, everything is assembled perfectly with no flaws. This is exemplified by the use of only titanium bolts and body panels with perfect fitment. Even with a hefty price of $375,000, nothing else in its price range is this pristine. Of course this explains why Lexus lost money on the LFA. With only 500 LFAs produced, the LFA ownership club is a small and exclusive, such celebrities as Paris Hilton and Oracle CEO Larry Ellison are members. For most people the closest they will get to owning one of these special cars will be seeing this car as it makes the last rounds on the show car circuit. Fortunately for the patrons of the Washington Auto Show, they get a viewing of this now out of production exotic car. For that reason it tops our list. You place a new Mustang on display at any auto show and it’s going to be a big hit. Then you add the allure of a low production Shelby Mustang that packs 662 horsepower and 631 lb-ft of torque from its supercharged 5.8 liter V8 (which is the most powerful engine to ever be offered in an American production car) under the hood and the result is a mega hot attraction. 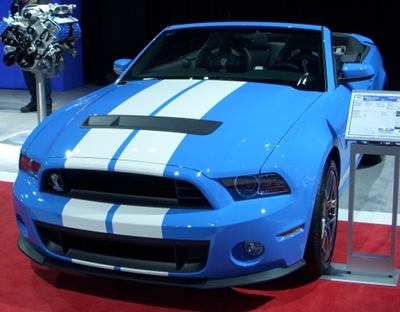 However it gets even better at this year’s Washington Auto Show, Ford brought along a 2013 Mustang Shelby GT500 convertible – nothing is better than enjoying all this horsepower with the convertible top down. Ford didn’t stop there with the excitement, this 662 horsepower super car is not stuck on a podium where show goers can only look from afar. No sir, this little wonder is sitting on the floor with the top down where it was accessible by all. Even if you don’t have the $59,995 to buy one, you could still sit behind the wheel, smell the fine leather interior, and fantasize about hitting the GT500’s 0-60 mph time of just 3.5 seconds and its top speed of 200 mph. The only bad was Ford temporarily removed the under dash hood release for the show, so there was no viewing of the GT500’s colorful and aesthetically beautiful engine. Sadly Carroll Shelby who first started modifying Mustangs back in 1965, passed away last year. The 2013 Shelby Mustang GT500 convertible is a great tribute to the man who elevated the Mustang to a true performance car soon after the first generation was released. The GT500 may be the signal of the end, for we may be having discussions 20 years from now lamenting on how it was highest horsepower American made car. Ford will soon be shifting gears and introducing an all-new sleeker and Euro friendly Mustang (apparently Ford believes Europeans don’t like retro looking Mustangs). Will this mean horsepower will take a massive drop when the new 2015 Mustang is introduced in a little less than 2 years from now? Ever increasing CAFE standards may force Ford’s hand in cutting horsepower output. Will there be a Shelby GT500 model? These as of yet are unanswered questions. However for many show goers this year it doesn’t really get any better than the 2013 Mustang Shelby GT500 convertible hence it easily garnered second place. The Camaro in its current fifth generation has been around for the last few years virtually unchanged so if you haven’t seen one you have either been hibernating with the bears or have been spending some time on another planet. The Camaro is part of the spirit of the new GM, the Camaro not only has added to the appeal and image of post-bankruptcy GM but it has been a big sales success. Where only a few short years ago the Mustang was the undisputed sales leader in the 2+2 coupe market as it has been for the last 20 years, the Camaro now is dead even with the popular Mustang in sales. Normally the hottest Camaro at this year’s auto show would have been the 580 horsepower Camaro ZL1 convertible sitting on the display floor (both the convertible and coupe version of the ZL1 were released last year to much celebration). 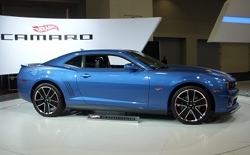 However the hot ticket at the show this year was the 2013 Chevrolet Camaro Hot Wheels Edition. What makes the Camaro Hot Wheels Edition so special is that it is the first time an automaker has taken a small Hot Wheels toy car and transformed it into a life size replica (usually it is the opposite). For something such as a concept car this doesn’t seem out of the ordinary, however when you discover that this special edition since late last October has been available for order and should hit Chevrolet dealership lots in the coming weeks. All Hot Wheels Editions will be standard with the following: the ZL1 rear spoiler (coupe only), ZL1 front upper grille, full ground effects package, 21 inch black wheels (full-size exact replicas of the classic Hot Wheels toy car wheels), two tone matte hood graphic, rear blackout taillight panel, fender flame graphics, and Hot Wheels grille and decklid badges. The Hot Wheels Edition is available in either a coupe or convertible. And three different engines are offered – the 323 horsepower 3.6 liter V6, 400 horsepower L99 6.2 liter V8, and 426 horsepower LS3 6.2 liter V8. You may be too big to play with Hot Wheels toy cars, however that’s not the case with the Hot Wheels Edition Camaro. For all intents and purposes, with Chicago taking precedence over Washington DC, it is truly amazing that Jaguar was able to have a 2014 Jaguar F-Type S convertible showcased at the show since production has not officially started yet. The F-Type is all-new to the Jaguar lineup, and it plugs a big hole in this lineup. For many years Jaguar has not had a 2-seater sports car offering. Granted the Jaguar XK was close, but there was no denying that with its back seat it still was a 2+2 coupe or 2+2 convertible. With the F-Type all this is over, Jaguar now has the 2-seater it has not had in its lineup since the 1960s and 1970s 2-seater XK. 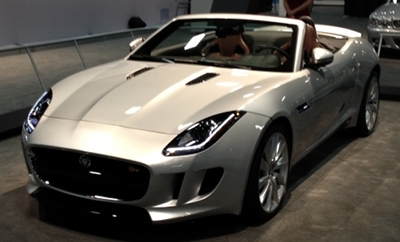 And in true Jaguar roadster tradition the F-Type only comes in a convertible model. The standard F-Type starts at just $69,000 and is standard with a 340 horsepower supercharged 3.0 liter V6 which is good for 0-60 mph in 5.1 seconds. And if this is not enough zip the F-Type S is available with a base price of $81,000 and a 380 horsepower supercharged 3.0 liter V6 – this was how the F-Type S was equipped at the show. The F-Type S can go from 0-60 mph in 4.8 seconds. And even if this isn’t enough there will be a F-Type V8 S which will be equipped with a 495 horsepower supercharged 5.0 liter V8 which will zip from 0-60 mph in just 4.2 seconds. Jaguar in the last few years has shed its conservative image for more radical and innovative styling. This has been a strategy that has been successful not only revitalizing Jaguar but setting forth with new styling themes that will make Jaguar a leader in the luxury and sports car markets for many years to come. The F-Type typifies this new Jaguar styling trend. The F-Type with its beautiful lines and plenty of punch under the hood is sure to be one of the hottest new performance cars for 2014. Jaguar has hit a home run with this car, and show goers were fortunately graced with its presence. It would have been a travesty had this car been rerouted to Chicago. When a Mercedes SL series just won’t do, that’s were the Mercedes SLS AMG comes into the picture. Fortunately for show attendees, Mercedes pulled all the stops and brought a SLS AMG GT coupe to the show. The SLS AMG has had the same overall styling since its introduction a few years ago. So why did this make the list? The introduction of the GT model for the US market for 2013 which knocks the SLS AMG up a few performance notches greatly adding to its appeal hence it making the the fifth position on our list. The attractive interior has the addition of extra touches for the GT model, but most important is the naturally aspirated 6.2 liter V8 (ignore the "6.3" badges on the exterior this is really a 6.2) now produces 583 horsepower and 479 lb-ft of torque which equates to a 0-60 mph time of around 3.6 seconds and a top speed of 199 mph. The SLS AMG GT comes mandatory with a 7-speed automatic transmission. 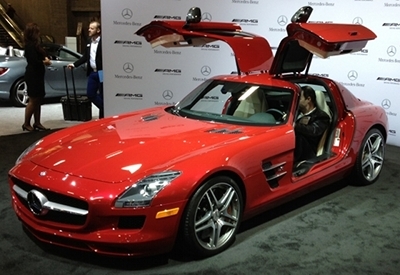 Fortunately Mercedes didn’t prop the SLS AMG GT on a platform, it left it on the show floor for all to see and touch. The coupe’s gullwing doors were even open to allow all to slip behind the wheel. This isn’t the easiest of cars to slide behind the wheel, due to the big hump that you must hurdle to get into the driver’s seat. However once there, the comfort and gadgetry are so immense you don’t want to leave the cabin. You soon discover the bottom part of the doors when popping out are easy for many tall people to bump their heads on. However this is par for the course for such an exotic car, the doors are a 11 out of 10 when it comes to wow factor when they are opened. If the gullwing doors are not your cup of tea, there’s also a convertible model which uses conventional type side doors. And Mercedes like most exotic automakers could have tacked on a bunch of racing type spoilers. It’s a good thing they didn’t because the SLS AMG GT has a sleek non-cluttered look that’s a modern version of the 1955 Mercedes 300SL (gullwing). This adds to it’s overall appeal because there’s no other new car that looks like the SLS AMG GT coupe on the road today, it’s in a class by itself. It’s worth every penny of its $220,000 base sticker price. « 2014 Chevrolet Corvette Stingray – the New 1970s Trans Am?